On a lark one hot summer Saturday afternoon a couple of years ago, I stopped by a local music store and bought a professional set of bongo drums. I didn’t know anything about percussions instruments, but I felt closer to Richard Feynman just holding them between my legs and tapping away. 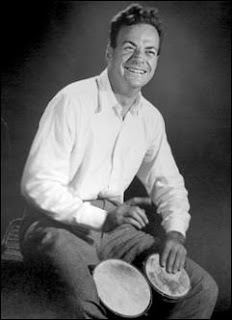 I soon discovered that playing the bongos is not a simple thing, and I grew a different sort of respect for Feynman being able to play this instrument so masterfully. On days of reflection, I throw the bongos in the back of my SUV and drive down to the beach to watch the waves and do the Feynman thing, read physics, beat the drums, and exercise my creativity in the face of nature. I’ll find a location with specific parameters – unobstructed view of the water, few people, slightly overcast skies if possible, and a gentle sea breeze. I swing open the back gate of the car, sit back, and savor the scene while I ponder the nature of quantum theory, cosmology, black holes, whatever. I keep a mini-library of select math and physics books in my car just in case I have some time and motivation to advance my knowledge. I also make sure I bring my laptop along with wireless broadband access to the Internet so I can quickly lookup arXiv.org articles (it’s more fun to be able to look up research paper references immediately whenever possible). And since we’re talking about Feynman, one day at Caltech there was a lecture about Feynman at the Beckman auditorium. One of the big attractions that day was the famed Feynman van parked in front of the Beckman. I had heard of this famed physics coach, and now there it was. This was the homey van Feynman used for family vacations. It was distinctive because the side panels had a number of Feynman diagrams painted on them. I loved seeing that old van in all of its grandeur. I became such a disciple of Feynman that I created a custom “Feynman diagram” baseball cap that included a simple Feynman diagram and a caption that read “Got Photons?” Yes, I am truly a Feynman groupie.